Bonnie S. Calhoun is Owner/Director of Christian Fiction Blog Alliance, owner/publisher of Christian Fiction Online Magazine, Northeast Zone Director for American Christian Fiction Writers (ACFW), the ACFW ‘2011 Mentor of the Year,” President of (CAN) Christian Authors Network, and Appointment Coordinator for both the Colorado Christian Writers Conference (CCWC) and the Greater Philadelphia Christian Writers Conference(GPCWC). For the last six years she has taught workshops in Facebook, Twitter, Blogging, and creating Social Media promotions at both CCWC, and GPCWC, and in 2011 at the Montrose, Pa Christian Writers Conference. She also taught a Facebook workshop at the 2012 ACFW conference. Bonnie and her husband live in a log cabin in upstate area of New York with a dog and cat who think she’s wait-staff. If you would like to read teh first chapter of Pieces of the Heart, go HERE. All information in the above post was provided by Christian Fiction Blog Alliance. All my reviews are my honest and personal opinion and are not influenced nor reviewed by the sponsor prior to posting. If you have any questions or comments, please see my FTC disclosure or Review Policy. 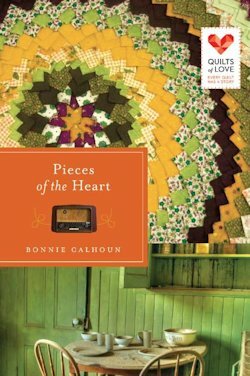 Thank you for your review of Pieces of the Heart by Bonnie S. Calhoun. I have never read anything by Ms. Calhoun, but I was moved by the description of the book. I can't imagine loving a man before he goes off to war and then having him return as a stranger. My thought is that in Christ I can do all things, including loving the man that I once knew, despite the changes that have taken place in his life.